Last fall, Tulane University and the Ashé Cultural Arts Center in New Orleans hosted the traveling exhibition, the Guantánamo Public Memory Project. This exhibition, which featured panels created by students at universities across the United States, asked viewers to engage with the long history of the U.S. naval base in Cuba, from its founding immediately following the Cuban War of Independence, to its use in the 1990s to hold Haitian and Cuban refugees, to current debates surrounding the base’s use in the War on Terror. In New Orleans, the exhibit provided an opportunity for Tulane students to engage with Gitmo and questions that the base raises about civic responsibility and the U.S.’s role in Latin America and the world. As part of their Service Learning project, the Tulane students in Introduction to Latin American Studies partnered with the Guantánamo Public Memory Project to create original, engaged scholarship on Gitmo. Their papers look at questions as varied as the role of race in the treatment of Haitian and Cuban refugees held at the base, the private family photographs of Americans living on GTMO during the Cold War, and the role of gender in sexual intimidation tactics used against detainees of the War on Terror. Other papers analyze the shared culture of incarceration that links Gitmo and New Orleans, the relation of Gitmo to U.S. immigration policies, and the experiences of current detainees as conveyed through their artwork. The papers cover five principle areas: Gender and Sexuality, Race, Visual Culture, Latin American Perspectives, and Intersections between New Orleans and Gitmo. Collectively, these studies provide different perspectives on the naval base, from the views of those held there as refugees or as detainees, to Cuban citizens faced with U.S. presence at the base, to American citizens thinking about how Gitmo and its policies have shaped our nation. Reading these papers, it becomes clear that Gitmo, often thought of as a remote and isolated place, is really at the heart of what America is. This scholarship, created by Tulane undergraduates, is now publicly accessible at https://gtmoinnola.wordpress.com/. 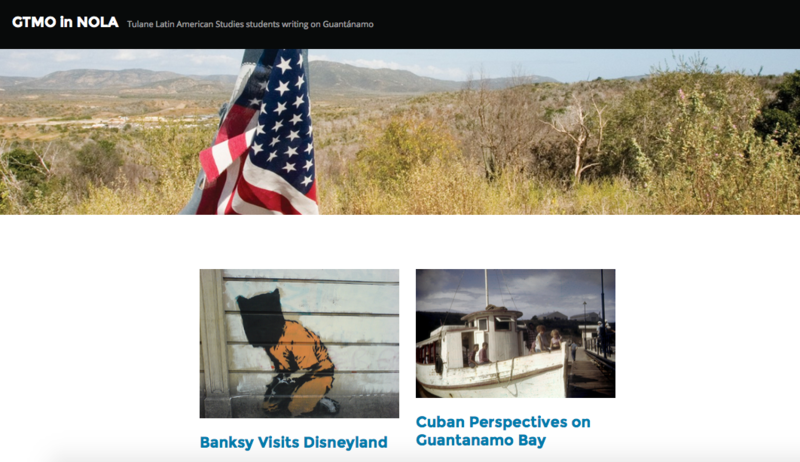 Visitors can learn about different facets of Gitmo, view rare archival photographs of the base from the collection of the Guantánamo Public Memory Project, and participate by sharing their own responses.